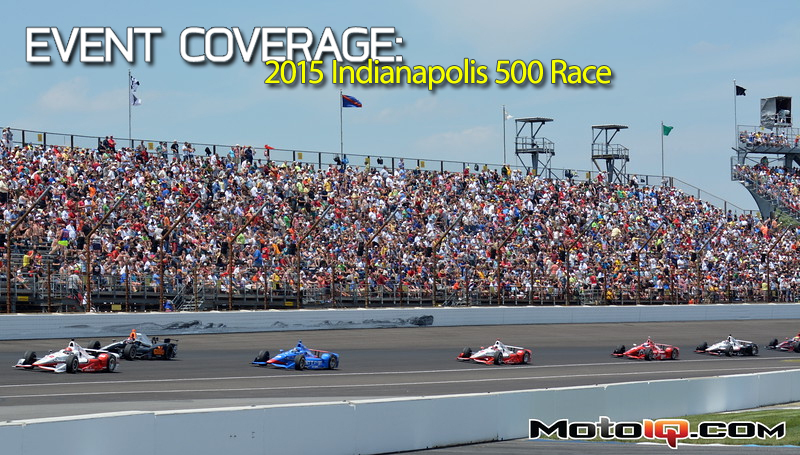 The Indianapolis 500 is an American icon. For 104 years, a 2.5 mile rectangular oval set in the Indiana countryside has been host to one of the longest enduring motorsports events in the world. The challenge is simple: build the fastest car you can. Tune it for maximum speed. Then, make it last for 500 miles at 225 miles an hour. Oh and make sure you do that faster than 32 other drivers. But cross that single yard of historic paving bricks first, and you join racing royalty. Drink the milk. Kiss the bricks. Have your likeness and name engraved on an antique silver cup. 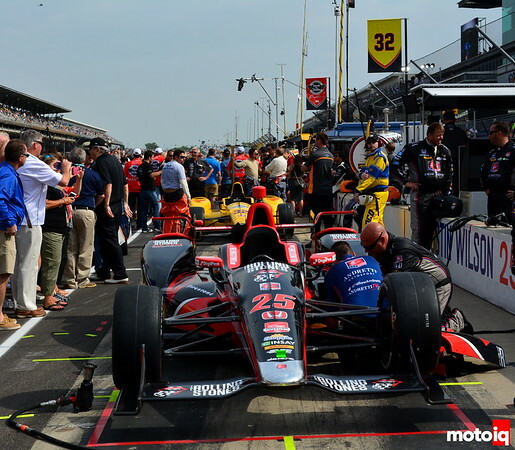 Be written into history as an Indianapolis 500 champion. Every year there are a number of stories to follow. Avid readers of MotoIQ will know many of them. The battle between Chevrolet and Honda for aero and engine dominance. Five different drivers winning five races. The scary aerial crashes, which caused qualifying to become a disconnected mess (and culminated in a nearly fatal accident for one driver, who thankfully is expected to make a full recovery). And most of all, could anyone take on the powerhouses of Roger Penske and Chip Ganassi? As morning broke on May 24th, the answers to these stories would soon be revealed. Teams first bring their cars to pitlane, making last-minute preparations. 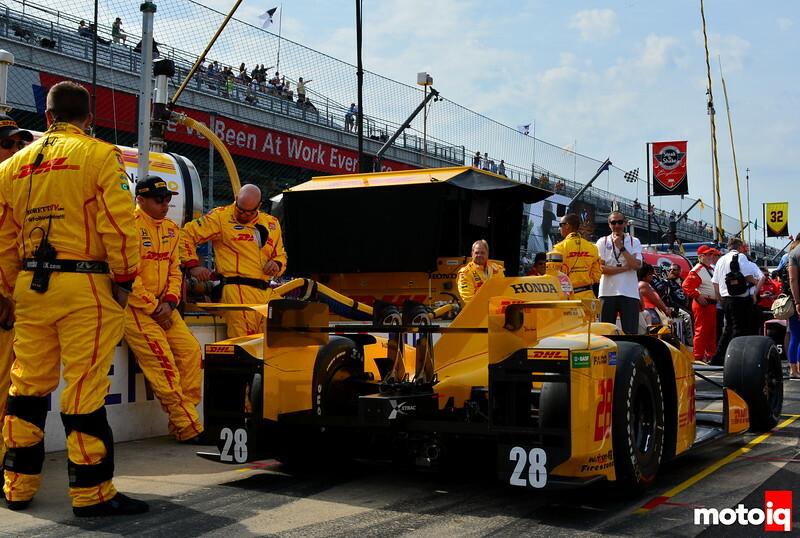 Most cars are 100% ready to go by this point, but there are always a few adjustments or checks that need to be made before the cars grid, the drivers strap in, and the engines fire. Some teams are more relaxed than others. Defending 500 champ Ryan Hunter-Reay’s team relaxes against the wall as they wait for the call to begin forming the famous 11 rows of 3. 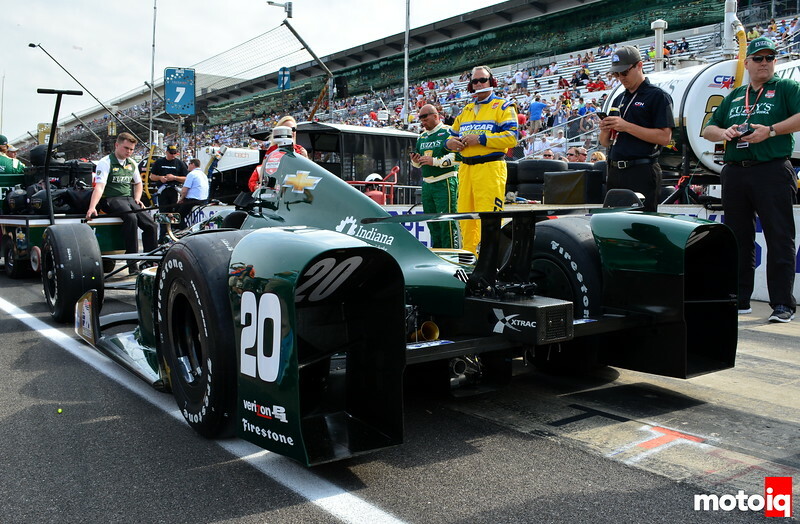 Ed Carpenter’s Chevrolet is ready to grid. This is his backup car after he wrecked his primary car in the warmup for qualifying, setting off the round of changes we mentioned in our last Indy piece. 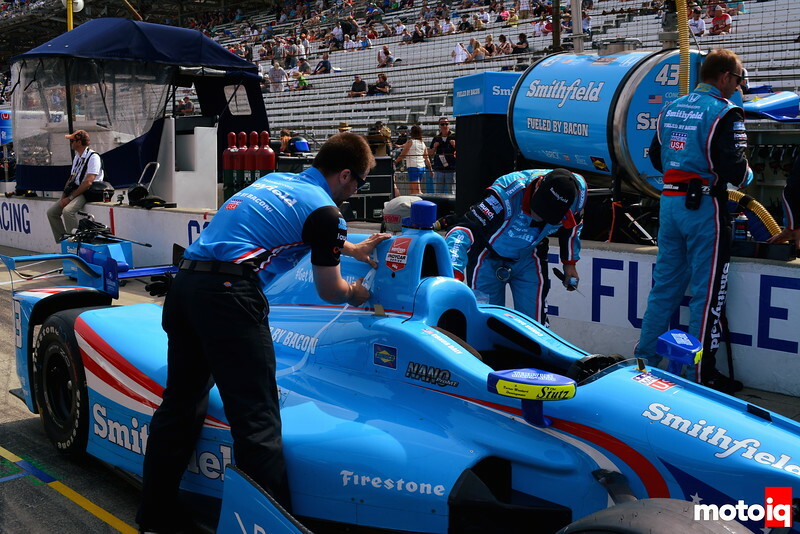 In Conor Daly’s SPM pit, the team was taping down the last of the body seams, removing that last little bit of speed sapping drag. Polystrand GT-Lite CRX: Part 4 – Bringing the Design Concept to Life!